In each issue of SP&T News, we will be highlighting a different alarm dealer. 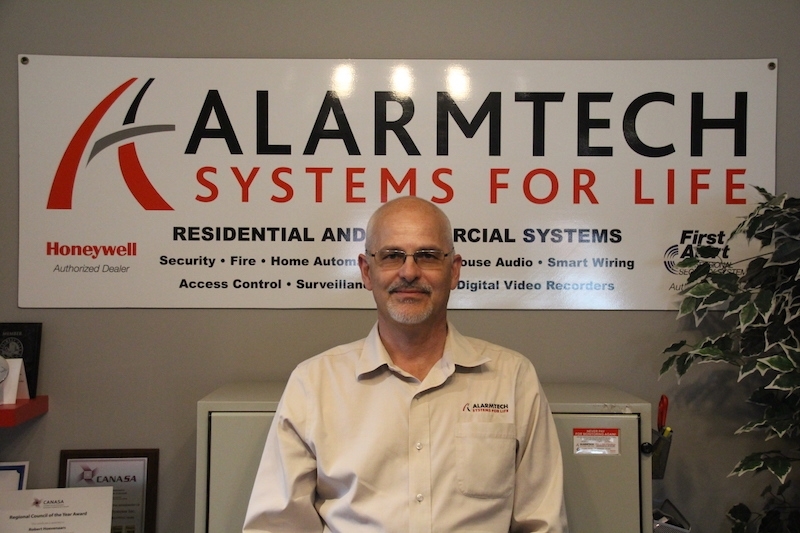 We recently spoke to Bob Hoevenaars, owner of London, Ont.-based Alarmtech Security Systems, to learn more about how the company has grown, the impact of technology and market trends, and more. Read the full Q&A below. SP&T News: What side of your business is showing the most growth? Is it residential, commercial, a mix of both? Bob Hoevenaars: It’s a bit of both, probably hedging a little bit more towards the commercial side of things, but we’re doing a lot more cameras and stuff on both sides, residential and commercial. SP&T: What new technology are you embracing? BH: We’re embracing connectivity on the security side of things, allowing our clients to have remote access and receive notifications in multiple ways on events and control of their system. And we’re doing that across the board — residentially and commercially. On the commercial side, we find that business owners really appreciate knowing their alarm system has been armed or knowing the time and who disarmed their alarm system. So in that case, they’ll really feel quite a bit of comfort, over and above what we used to be able to offer in the past. On the residential side, people just really like the cool idea of being able to be in touch with their home. SP&T: So what impact (if any) is DIY or MIY having on your business? BH: At this point and time I don’t think it has a lot of impact on my business yet. There’s still a lot of people out there who want and need a personal consultation. We just did a system the other day and there are 70 zones in this one person’s house — obviously they’re not going to DIY something like that. But on the smaller end of things, I do think it’s coming, it’s going to grow, and we’re looking at ways to be able to embrace that opportunity when it starts becoming more mainstream. SP&T: Are the kinds of questions your customers are asking different than five or 10 years ago? SP&T: With Amazon and Google in the mix, how is that affecting the traditional alarm market? BH: We do have people wanting to have Alexa in part of their system. At this point and time, we’re using it more as an enhancement rather than a replacement. But we struggled with the market for many, many years, where 20 per cent of the people got involved in security, and I believe that this is kind of opening the doors to higher and higher numbers. SP&T: Is the industry as a whole moving the needle on home alarm market penetration rates (currently stuck around 20 or 25 per cent)? BH: I think they will be helping move that needle. I think that the 20, 25 [per cent] might grow to 30, 35 [per cent], and if we keep working at it and providing what the end user is looking for, then we can become a decent portion of that 60 per cent middle portion of the market. This article originally appeared in the June/July 2018 issue of SP&T News.